Do you ever read blogs and wish you knew fun facts about those bloggers like you would a best friend? I know I do. 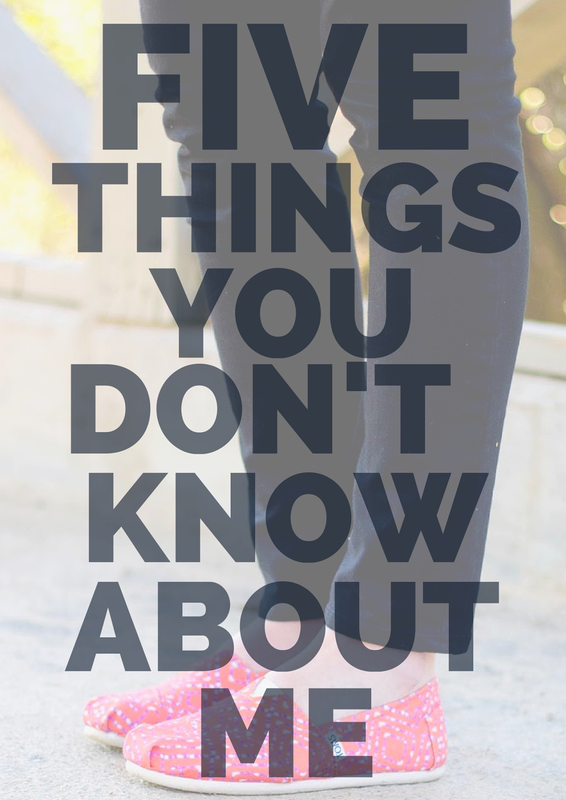 So I started my "Five Things" series so you could get to know the random tidbits about my life! 1 | I started piano lessons when I was seven and played through high school. 2 | One of my biggest pet peeves is when someone uses their cell phone while in a movie theater. I cannot even tell you how much this frustrates me. First of all, everyone can see you and your bright-as-the-sun phone screen. Second, I paid (and so did you) to see this movie, so SEE the movie. Third, can you really not go two hours without looking at your phone? I think that says some sad things about our culture. 3 | I broke my nose in college during an ultimate frisbee game. I was passing this guy while running for the disc and he decided to turn at the exact time of me passing him. I was head-butted in the nose, fell to the ground, blacked out, and was bleeding from a big cut on my nose. I didn't know until later that night that my nose was actually broken. I ended up having surgery to fix the bone and had to wear a nose brace at night for a couple of months. It was really attractive. 4 | Coconut is not my favorite thing to eat. 5 | My family is related to Wallace the Bruce. WHAT IS ONE THING I DON'T KNOW ABOUT YOU? SEE OTHER "FIVE THINGS" HERE. #4. I thought I was the only one that had an aversion to coconut. Shredded coconut makes me cringe! Don't mind the smell at all though - but it took a few years for me to like it. #5. Have you been to Scotland? The William Wallace memorial is AWESOME. Put it on your adventure list ASAP! #3...STAPPPPPPPP so you mentioned breaking your nose over the weekend but i didn't know how OMG that isn't funny, but it kind of is. Okay I might be wrong.....but I think I'm related to Wallace the Bruce also. Don't quote me on this because I always get my family history wrong but I swear we are!!! i used to not like coconut but can't get enough of it now… such a fun post! Isn't it weird how our tastes change? Haha! That or I'm just accident prone! So fun! I still sit down to play every now and then. OMG we could be related ;) I love learning about family heritage! Yes! I am not alone. Can't stand the texture!